Are there different types of necrotizing fasciitis? Who is at risk to get necrotizing fasciitis? How do health care professionals diagnose necrotizing fasciitis? What types of doctors treat necrotizing fasciitis? What is the treatment for necrotizing fasciitis? Is it possible to prevent necrotizing fasciitis? Is necrotizing fasciitis contagious? What is the prognosis (outcome) for patients with necrotizing fasciitis? What are complications of necrotizing fasciitis? What are some additional sources of information on necrotizing fasciitis? Necrotizing fasciitis refers to a rapidly spreading infection, usually located in fascial planes of connective tissue that results in tissue death (necrosis). Different types of bacterial infection can cause necrotizing fasciitis. The majority of cases begin with an existing infection, most frequently on an extremity or in a wound. Necrotizing fasciitis is a serious condition that is often associated with sepsis and widespread organ failure. Treatment of an infection caused by flesh-eating bacteria involves rapid antibiotic administration and/or surgical debridement of the wound areas as well as supportive measures such as insertion of a breathing tube, intravenous administration of fluids, and drugs to support the cardiovascular system. Good hygiene and wound care can reduce the chance of developing the disease; necrotizing fasciitis is not usually contagious but it is possible to transmit infectious agents to other people (cross-contaminations of wounds, for example). Immunosuppressed individuals (for example, diabetics, elderly, infants, those with liver disease, alcoholics, or those taking immunosuppressive drugs such as chemotherapy for cancer) are at higher risk to develop the disease. The prognosis depends on how fast the infection is diagnosed and treated and the patient’s response to treatments; outcomes usually range from fair to poor with complications including tissue loss and or amputation of limbs. Necrotizing fasciitis is a term that describes a disease condition of rapidly spreading infection, usually located in fascial planes of connective tissue that results in tissue necrosis (dead and/or damaged tissue). Fascial planes are bands of connective tissue that surround muscles, nerves, and blood vessels. Fascial planes can bind structures together as well as allow body structures to slide over each other effectively. The disease occurs infrequently, but it can occur in almost any area of the body. Although many cases have been caused by group A beta-hemolytic streptococci (Streptococcus pyogenes), most investigators now agree that many different bacterial genera and species, either alone or together (polymicrobial infections), can cause this disease. Occasionally, mycotic (fungal) species cause necrotizing fasciitis. Popular publications and the media term necrotizing fasciitis as a "flesh eating" or "skin eating" disease or infection. In addition, the organisms that typically cause necrotizing fasciitis are termed "flesh-eating bacteria" or "flesh-eating parasites" because of the rapid rate with which they can infect and kill human tissue. Historically, several people described this rapidly advancing condition in the 1840s to 1870s; however, Dr. B. Wilson first termed the condition “necrotizing fasciitis” in 1952. It is likely that the disease had been occurring for many centuries before it was first described in the 1800s. 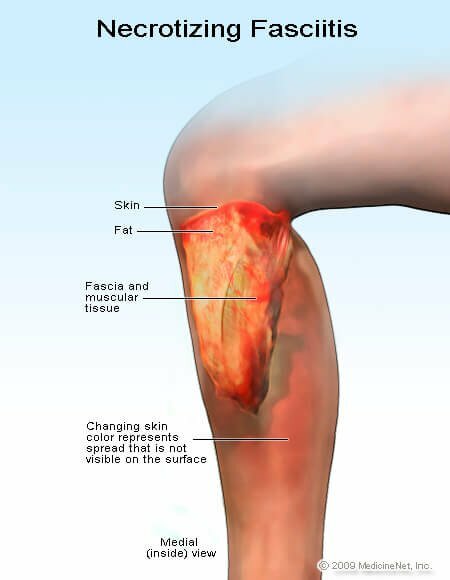 Currently, there are many names that have been used loosely to mean the same disease as necrotizing fasciitis: flesh-eating bacterial infection or flesh-eating disease; suppurative fasciitis; dermal, Meleney, hospital, or Fournier's gangrene; and necrotizing cellulitis. Body regions frequently have the term necrotizing placed before them to describe the initial localization of necrotizing fasciitis (for example, necrotizing colitis, necrotizing arteriolitis), but they all refer to the same disease process in the tissue. Important in understanding necrotizing fasciitis is the fact that whatever the infecting organism(s), once it reaches and grows in connective tissue (fascial planes), the spread of the infection can be so fast (investigators suggest some organisms can progress to involve about 3 centimeters of tissue per hour) that the infection becomes difficult to stop even with both antimicrobial drugs and surgery. Fortunately, this disease is relatively rare; various statistical sources estimate about 500 to 1,500 individuals are reported to have the disease per year in the U.S.
Statistics show mortality (death) rates have been reported as high as 75% for necrotizing fasciitis associated with Fournier's (scrotal) gangrene, but the mortality in patients with the infection in other regions of the body (for example, legs or arms) is about 25%. Patients with necrotizing fasciitis have an ongoing medical emergency that often leads to death or disability if it is not promptly and effectively treated. Variations of necrotizing fasciitis are placed by some investigators into three general groups or types, roughly based on the type of organisms causing the infection and some clinical findings that vary from patient to patient. Type 1 is either caused by more than one bacterial genera (polymicrobial) or by the infrequently found single bacterial genus such as Vibrio vulnificus or fungal genera such as Candida. Type 2 is caused by Streptococcus bacteria, and type 3 (or termed type 3 gas gangrene) is caused by Clostridium bacteria. One example of clinical findings (gas in tissues) is more often found in type 3 but can be found in types 1 and 2 also. Many investigators elect not to use this typing system and simply identify the organism(s) causing the necrotizing fasciitis. Bacteria cause most cases of necrotizing fasciitis; only rarely do other organisms such as fungi cause this disease. Group A Streptococcus and Staphylococcus, either alone or with other bacteria, cause many cases of necrotizing fasciitis, although Clostridium bacteria should be considered as a cause especially if gas is found in the infected tissue. Because of better microbial isolation techniques for anaerobic (grow in the absence of oxygen) bacteria, bacterial genera such as Bacteroides, Peptostreptococcus, and Clostridium are often cultured from the infected area. Frequently, culture of tissue involved by necrotizing fasciitis also yields a mixture of other aerobic (require oxygen to grow) bacterial types such as E. coli, Klebsiella, Pseudomonas, and others. Many investigators conclude that non-anaerobic organisms damage tissue areas enough to cause local areas of hypoxia (reduced oxygen) where anaerobic organisms then can thrive and extend the infection further. This results in polymicrobial infection in which one type of bacteria aids the survival and growth of another type of bacteria (synergy). Infrequently, Vibrio vulnificus causes the disease when a person, usually someone with liver function problems (for example, alcoholics or immunosuppressed patients), eats contaminated seafood or a wound gets contaminated with seawater containing Vibrio vulnificus. Other organisms may rarely cause necrotizing fasciitis, but when they do, the resulting infections are often difficult to treat successfully. For example, Aeromonas hydrophila (a Gram-negative rod-shaped bacterium) was the source of this disease in a 24-year-old who cut her thigh in a homemade zip line accident in the U.S. The organism established itself and caused the otherwise healthy young woman to have her leg amputated, and she may suffer further complications over time. Although Aeromonas hydrophila is usually associated with warm brackish water and causes infections in fish and amphibians, gastroenteritis is the disease it causes most often in humans when the water sources are swallowed. Because it is often resistant to multiple antibiotics, it is difficult to eradicate if it infects human tissues. In addition, once it infects tissues, its enzymes and toxins allow a rapid entrance of the organisms to the bloodstream, causing sepsis and infection of other body organs. In general, the bacteria that cause necrotizing fasciitis utilize similar methods to cause and advance the disease. Most produce toxins that inhibit the immune response, damage or kill tissue, produce tissue hypoxia, specifically dissolve connective tissue, or do all of the above. In polymicrobial infections, one bacterial genus may produce one toxic factor (for example, E. coli causing tissue hypoxia) while different types of coinfecting bacteria may produce other toxins that lyse (disintegrate) damaged tissue cells or connective tissue. In general, this disease is not contagious, but the organisms that may lead to its development are contagious, usually by direct contact between people or items that can transfer the bacteria. People usually need a break in their skin (cut, abrasion) for these flesh-eating bacteria to cause disease. Theoretically, anyone with an infection has a small risk of getting necrotizing fasciitis; the risk factors begin to increase if the infection occurs in immunosuppressed individuals (for example, diabetics, elderly, infants, those with liver disease, or those taking immunosuppressive drugs such as chemotherapy for cancer). Visible infections (skin, hair follicles, fingernails, visible trauma sites) are more likely to be noticed and treated than some deep infections. Patients who have any deep infections (muscle, bone, joint, gastrointestinal) are at somewhat higher risk for the disease because the initial infection and subsequent spread is usually not as noticeable as more visible infections. Although pregnant women rarely develop the disease, the risk increases in the postpartum period, especially if the mother has diabetes and has procedures such as cesarean delivery (C-section) or episiotomy. Necrotizing enterocolitis occurs mainly in premature or sick infants and may be another variant of necrotizing fasciitis, but there is still controversy about the cause of this disease. Necrotizing fasciitis has interesting demographics; more males than females are affected (about three to one), and Vibrio vulnificus infections seem limited to coastal areas with warm water where the organisms are found associated with seafood and contaminated water. Instead of healing, the infected site (see above) can show erythema (redness) and swelling. The site may be very sensitive to pain, and skin pain can occur even past the area of erythema. The presence of pain is far in excess of what would be expected based upon physical findings. Fluid and/or pus draining from the site can occur rapidly as the infection progresses. Some patients can become septic (meaning the infection has spread to the bloodstream and throughout the body) before the skin changes are recognized, especially when flesh-eating disease begins in deep facial planes. Necrotizing fasciitis type 1 often occurs after trauma or surgery and may form little or undetectable amounts of gas. Type 2 usually occurs after more simple skin trauma (cuts, abrasions, and insect bites) and infects more superficial facial planes with almost no gas formation. Type 3 usually occurs after trauma or after wounds become contaminated with dirt that contains Clostridium bacteria, which produce gas in tissues (gangrene) and necrotic eschars. However, symptoms for types 1-3 are not definitive, and symptoms vary widely which is why some investigators prefer to define individual patients' disease by the organism(s) isolated from the patient rather than assigning a type label. One set of patients that is being recognized with a more specific set of symptoms and health history are those infected with Vibrio vulnificus. The organisms occur in the warmer waters in the U.S. (Gulf of Mexico and southern coastal states) and elsewhere in the world with similar water conditions. Either ingesting the organisms or getting Vibrio vulnificus from contaminated seawater into skin abrasions or cuts can cause necrotizing fasciitis. The majority of those affected is either immunosuppressed or has chronic liver problems (for example, alcoholic liver disease, hepatitis, or cirrhosis). Bullae formation and rapid progression of the disease (within hours) on the extremities are hallmarks of Vibrio vulnificus wound infections. Even though a single type of bacteria causes this infection, some investigators classify it as a variant of type 1 necrotizing fasciitis. Necrotizing enterocolitis (also termed NEC; necrosis of gastrointestinal tissue) occurs mainly in premature or sick infants and may be another variant of necrotizing fasciitis. Although investigators suggest that bacterial infection causes this disease, there is no definitive data to prove this and others attribute the disease to a dysfunction of the intestinal tissue. Often a preliminary diagnosis of necrotizing fasciitis is based on the patient's symptoms, including the medical and exposure history as described above. For example, a diabetic patient with a rectal fistula who develops pain, swelling, and scrotal skin changes may be preliminarily diagnosed with Fournier's gangrene, while another diabetic patient with liver failure and skin changes (bullae) and exposure to seawater may be preliminarily diagnosed with a Vibrio vulnificus infection. Initial treatment is often begun based upon a preliminary diagnosis because waiting for a definitive diagnosis can delay treatment and result in increased morbidity and mortality. Gram staining of exudates (fluid from the infection site) or biopsied tissue may provide the physician clues to determine what organism(s) are causing the infection. For example, the stain can distinguish between Gram-negative and Gram-positive organisms and further distinguish their shapes (coccus or round, rod, or comma-shaped like Vibrio). Definitive diagnosis depends on isolation of the organism(s) from the patient using both aerobic and anaerobic isolation techniques, and rarely, fungal culture methods. Organisms isolated from necrotizing fasciitis need to have studies done to determine antibiotic resistance, because many organisms causing the disease are multidrug resistant. A surgeon needs to be consulted early to help obtain tissue samples and to be involved with potential treatment protocols (debridement, amputation). Although X-rays occasionally show gas in tissues, investigators suggest doing Doppler ultrasound, CT, or MRI studies to help show gas in tissues and to help delineate the extent of the infection. Most physicians run additional tests such as white blood cell (WBC) counts (elevated in necrotizing fasciitis), BUN (blood urea nitrogen), sodium (decreased in necrotizing fasciitis), and other tests to monitor the patient. There are many types of doctors that can be consulted for treatment of necrotizing fasciitis. Specialists in emergency medicine, critical care specialists, infectious-disease specialists, and many types of surgeons, depending upon the location of necrotizing fasciitis, should be consulted. For example, testicular involvement would require a urologic surgeon, while necrotizing fasciitis involving the leg may require general surgeon, a plastic surgeon for skin/scar repair, and for vaginal necrotizing fasciitis, an OB/GYN surgeon. At the time of preliminary diagnosis, the patient needs to be hospitalized and started on intravenous (IV) antibiotics immediately. The initial choice of antibiotics can be made based upon the types of flesh-eating bacteria suspected of causing the infection, but many doctors believe that multiple antibiotics should be used at the same time to protect the patient from methicillin-resistant Staphylococcus aureus (MRSA, or sometimes termed flesh-eating bacteria in the popular press), as well as infections with anaerobic bacteria, and polymicrobial infections. Antibiotic susceptibility studies, done in the laboratory after the infecting organism(s) has been isolated from the patient, can help the physician choose the best antibiotics to treat the infected individual. A surgeon needs to be consulted immediately if necrotizing fasciitis is suspected or preliminarily diagnosed. Surgical drainage and/or debridement of necrotic tissue and collection of tissue samples, needed for culture to identify the infecting organism, are done by a surgeon. The surgeon may also recommend negative pressure wound therapy (vacuum dressing to promote wound healing). The type of surgeon consulted may depend on the area of the body affected; for example, a urologic surgeon would be consulted for Fournier's gangrene. As is the case for immediate antimicrobial therapy, early surgical treatment of most cases of necrotizing fasciitis can reduce morbidity and mortality. Many patients with necrotizing fasciitis are very sick, and most require admission to an intensive care unit. Sepsis and organ failure (renal, pulmonary, and cardiovascular systems) need to be treated aggressively to increase the patient's chance for recovery. Treatments such as insertion of a breathing tube, intravenous administration of fluids, and drugs to support the cardiovascular system may be required. Although not available in many hospitals, hyperbaric oxygen therapy (oxygen given under pressure with the patient in a specialized chamber) is sometimes used in treatment as the oxygen can inhibit or stop anaerobic bacterial growth and promote tissue recovery. This therapy does not replace antibiotics or surgical treatment. However, hyperbaric oxygen therapy has been shown by researchers to further reduce morbidity and mortality by about 10%-20% in some patients when used in conjunction with antibiotics and surgery. Some patients have such extensive damage to limbs that they require skin grafting, plastic surgery, or even amputation. The duration of treatment for necrotizing fasciitis is highly variable and often depends upon the extent of the disease and how well the patient responds to treatments. Patients with extensive disease may take months of treatment especially if they need skin grafting and/or plastic surgery. Necrotizing fasciitis does not begin unless an infection has already started in tissue; immediate effective treatment of any infection is likely to prevent the disease. Further, anything that can help prevent infections will help prevent necrotizing fasciitis. Practices such as hand washing, checking extremities for cuts or wounds if you have diabetes, avoiding physical contact with people who carry MRSA, and good hygiene practices help prevent initial infections that may lead to flesh-eating disease. Immunosuppressed patients should be very careful not to get infections, and people with liver disease should avoid eating seafood that may be contaminated with Vibrio vulnificus. People with liver disease should not have any infections or cuts in the skin exposed to warm seawater to avoid necrotizing fasciitis caused by Vibrio vulnificus. Physicians, surgeons, and other caregivers play an important role in prevention. Cases of necrotizing fasciitis may occur when surgical sites become infected. Consequently, physicians need to use sterile techniques when doing surgery and adhere to hospital practices such as glove and gown coverage to help prevent infection spread in hospitalized patients. Careful surgical techniques in sites that can easily become contaminated are required. Some examples of such sites are bowel surgery, episiotomy (surgically enlarging the vaginal outlet), and debridement with closure of traumatic wounds. Necrotizing fasciitis is not usually contagious. However, it is possible for uninfected people to physically come into contact with some patients with the disease and become infected with an organism that may eventually cause necrotizing fasciitis. For example, a person could come in contact with a lesion containing MRSA organisms causing or contributing to the disease in another person and then become infected with MRSA. Transmission from one person to another usually requires direct contact with a patient or some item that can transfer organisms like MRSA to another person's skin; infection usually requires a skin break (cut or abrasion) for the organisms to establish an infection (cross-contamination of infected wounds). Untreated necrotizing fasciitis has a poor prognosis; death or severe morbidity (for example, limb loss) is the frequent outcome. Even with appropriate treatment, the mortality (death) rate can be as high as 25%. Infection with MRSA and other multidrug-resistant organisms tends to have higher morbidity and mortality rates. Combined mortality and morbidity (for example, limb loss, scar formation, renal (kidney) failure, and sepsis) for all cases of necrotizing fasciitis has been reported as 70%-80%. Cases of Fournier's gangrene have reported as high as 75% mortality rates, while cases of Vibrio vulnificus-associated necrotizing fasciitis have about a 50% mortality rate. Fortunately, Vibrio vulnificus infection is relatively uncommon, but the incidence seems to be increasing. The U.S. Centers for Disease Control and Prevention (CDC), in 2007, made Vibrio vulnificus infection a reportable disease so the statistics on the incidence (frequency of occurrence) should be more easily obtained in the future. The worst complication of this disease is rapid advancement that results in death. Other serious complications include tissue loss requiring surgical removal and amputation to limit disease, as well as sepsis, kidney failure, and extensive scarring. Asan Borja, Bianca. "Emergent Management of Necrotizing Soft-Tissue Infections." Medscape.com. Dec. 23, 2015. <http://emedicine.medscape.com/article/784690-overview>. "Necrotizing Fasciitis (Flesh-Eating Bacteria)." WebMD.com. July 23, 2016. <https://www.webmd.com/a-to-z-guides/necrotizing-fasciitis-flesh-eating-bacteria-topic-overview>. United States. Centers for Disease Control and Prevention. "Necrotizing Fasciitis." Oct. 26, 2017. <http://www.cdc.gov/features/necrotizingfasciitis/>.